I was looking for a shared website hosting for a long time and I found a few that it is not a shame to recommend. And GoDaddy is one of them. Even if I can not say that hard drive in this server is relaxing, Load Average is acceptable. 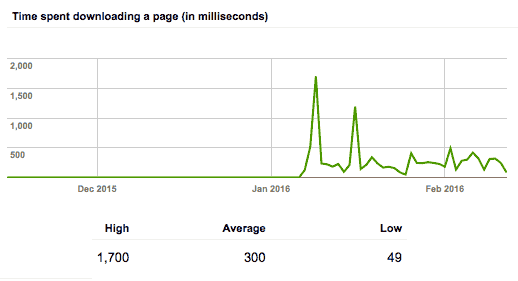 That’s why Google Webmaster Tools reports quite good response time from this server. Most of files are cached in memory and returned to a client without any disk access at all. We could see that it almost never took Google bot more than 0.5 set to get response from this server. It’s a good performance. Also this server is equipped with fast enough CPU, which makes me think that packing backups will not become a problem for even huge sites. GoDaddy allow to install custom SSL certificates and does not require to purchase IP address for that. This is a huge Plus. There are a few minuses at the same time. The server have two IP addresses: private and public. Private is used for SSH access and public one is used for DNS, HTTP, HTTPS, etc. This is not a big problem, you’ll just have to remember that they a different. And that’s all the minuses I’ve found. So I want to say that GoDaddy provides one of the best shared hosting services I’ve found so far.